Denise Williams was born in Point Pleasant, West Virginia. 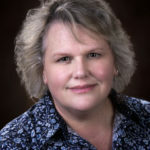 She received her Diploma in Nursing from St. Mary’s School of Nursing in 1983 in Huntington, West Virginia and a Bachelor of Science in Nursing from West Virginia University in 1989. She attended University of South Alabama for her Master of Science in Nursing and graduated in 1988. She is a board certified Acute Care Nurse Practitioner from the American Nurses Credentialing Center and Adult Nurse Practitioner from the American Academy of Nurse Practitioners since 1999. She has been practicing with Gastroenterology Associates since 1999.